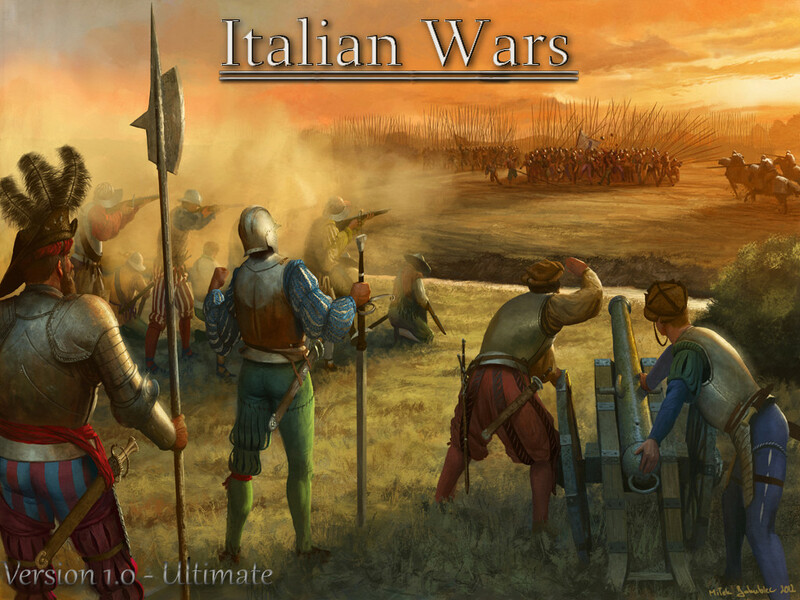 After almost three years I am very proud to present to you a 'nearly' finished version of my final work: The Italian Wars | Ultimate. This version was intended as a proper ending to the Italian Wars scenario. Sadly though, that will not happen in the future, due recent development in my reallife. Nevertheless, you will find a more than playable version below. Of course, it has not been tested as I did intent, but I'll stick around to lend you guys a hand if any major issue occur. Miscellaneous: Smoothed coastlines. New menu and loadingscreens. Native languages for almost every faction. - Untis from "With fire and sword 2"
Hope you enjoy the mod! Congratulations, Aneirin! Looks impressive! It feels I have to come back to this period of history! I kept silent but after installation I will say that this is the masterpiece. I adore this period and even had bought books about it and it is a treat to have renaissance battles. So much opportunities for implementation of combined arms where firearms and artillery complement halberds, swords and pikes. I adore mercenary captains and doppelsoldners, now they make the difference. I hope you will be able to fix potential bugs because we need you to polish even more this diamond. Greetings from Europe and thank you. Is there a possibility of implementation of the elite Landsknecht Doppelsoldner arquebusiers? Fantastic work! It is a pity that this is the end, but thank you once again for putting so much effort in this great project. Do i need to run the exe. file to the Medieval 2 total war mod folder, because every time i run the shortcut it says cant find medieval2.exe file? Many thank's for your praise! Well, I'll try to, but already struggle to so.. RL keeping me quite busy..
Do you use steam to play Medieval 2 Total War? I can often manage to use appropriate mods with Steam but I would love to use this mod - can I do so with Steam ? If there are any ways around W10 Id love to hear them. Yes. Although i do also have the disk version. Let me know if you were able to start the mod. I actually have downloaded stainless steel and currently play it now. Can the Italian Wars mod be downloaded along side other mods or do i have to delete SS. You may have it along on your drive. these are mod-foldered. or the Broken Crescent + Buff and Shine submod. Reviews of the mods: SSHIP (2018), Wrath of the Norsemen (2018), Broken Crescent (2018). Thrones of Britannia: review, opinion on the battles, ideas for modding. Minimods for the SSHIP: Generals Traits, Provincial Titles, Crowns. Short guides for the SSHIP: population growth, forts and watchtowers. Pros and cons of having Merchants in an M2TW mod. Home rules for playing a game without exploiting the M2TW engine deficiencies. Dominant strategy in Attila TW and Rome 2 TW: “Sniping groups of armies”. Although I didn't contribute to this mod very much, I was glad to be a part of the team none the less! ok, so this is what i've done. However everytime i run the desktop shortcut "Die Italienischen Kriege - Ultimate" or the "Executable" file it runs the vanilla game instead. Sorry to be such a pain, i'm sure i'm making this harder than it is. Always been terrible at installing mods. afaik, you should not put the (perhaps older) Steam games in the "program files" folder. Set up a new folder (c:\games or even better on another drive) and install all older games there. I think it's possible to make a transfer to another folder - an option in the Steam. However, if you manage to run Mediveal, it means you still can do it... I think there's a wrong path in the shortcut. I'd go to the mods/italian_wars folder and run a program from there. Or check the paths. Yeah, my other mods such as Third age total war and Stainless Steel are in the "program files" folder and work. Where did you download yours to? Can you show me what your pathway looks like when you run yours?